I’ll be honest: going into this episode, I wasn’t sure I would be able to get much out of it to write about due to the fact that most of it is rather comedically oriented. Fortunately, though, I wound up with plenty of stuff to talk about (not a huge surprise), especially since it seems like Nagai really liked the ghost/UFO stuff—his direction with the scene last episode and at the end of this episode has been inspired stuff. 0:06—As if they really needed something else…this is one more thing to unify the two of them. 0:33—Scare Minori? An entrance like that would do it. 1:13—Another big thank you to the translators: Yeah, scare the bejeezus outta her! 3:41—I love the way she responds here. “Was that a compliment? Yay.” But, thanks to Yui Horie’s excellent voice acting work, it sounds like she’s actually thankful, just a bit distracted. 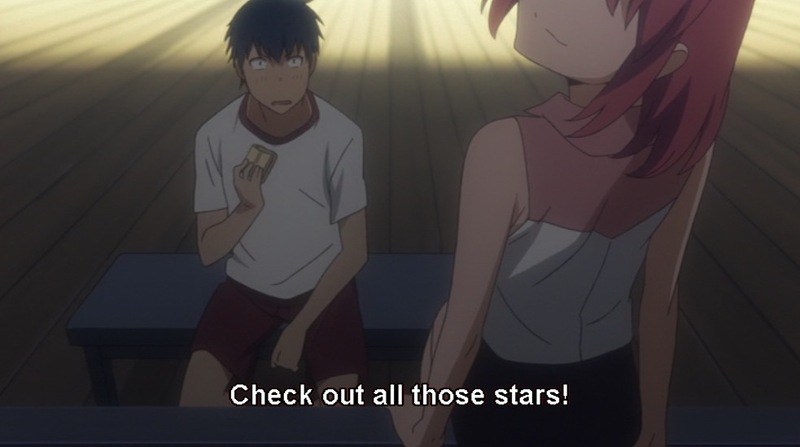 3:58—She’s literally just held a cut onion up to her eye and Ryuuji is still enthralled. It does not matter what she does. It’s also cute how the music stops here for a second and then picks up as he goes back to work. 4:18—Okay, here. 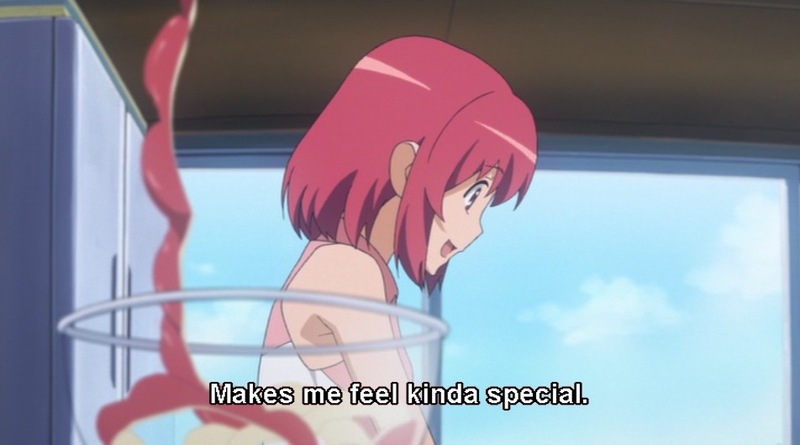 I’ve always wondered about Minori’s intentions with the stuff she says here about feeling special and about the girl who marries Ryuuji being lucky. No matter which way I spin it in my head, I just can’t see this as a totally innocent moment on her part. She’d have to be monumentally dense in terms of people awareness (and previous episodes have shown that’s not true) to say what she says without any sort of hidden motive. So what’s she playing at? Or am I just being stupid in not trusting that she’s just dropping these lines as a friend? 4:28—A nice parallel with this shot from last episode. 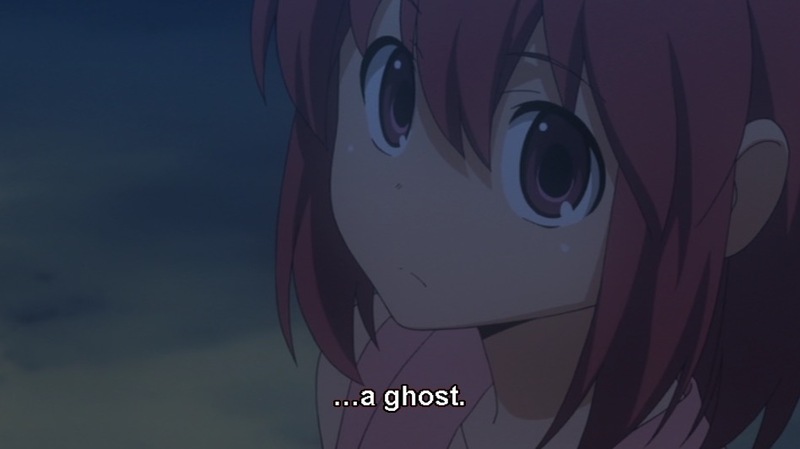 Ryuuji tries to bring the conversation back to the ghosts and suddenly we don’t see her eyes anymore. 4:37—Man, this says a lot about her. She’s not taking back any of what she said, but she’s saying she sort of wishes she hadn’t said it. That having that part of her unveiled makes her nervous. That even though she trusts him, she doesn’t quite trust him that much. 4:51—Ami just listening, filling in the gaps. 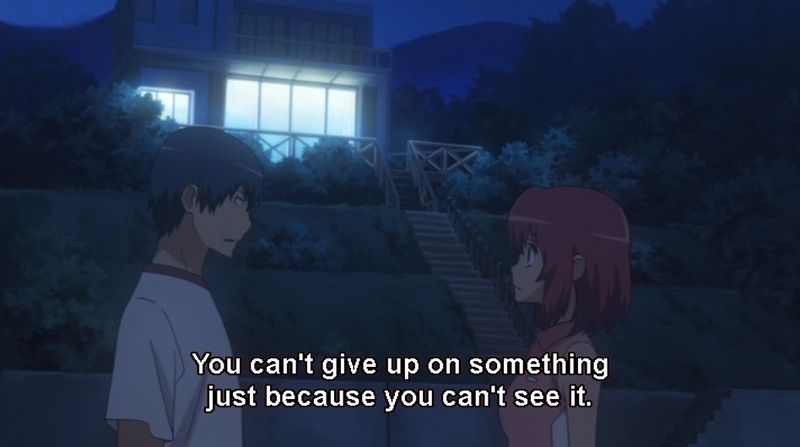 5:25—It makes me happy that Taiga’s not so smitten with Kitamura that she’s given up her independence. 5:38—It’s such an arrogant thing to say, but such a great line from her. She expresses a comfort with her body that Minori and Taiga aren’t even close to. It makes sense with her being a model, but still. 6:03—Man, she’s good. It’s pretty obvious that this is a rhetorical question (she certainly already knows the answer), if a bit unfair. 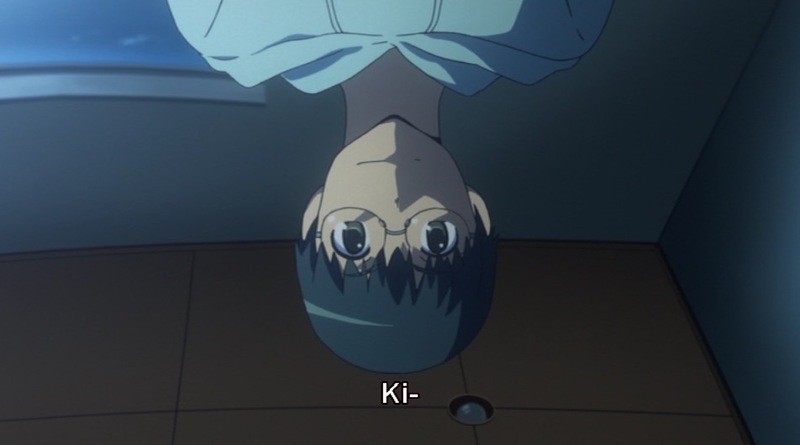 And Ryuuji’s silence is telling. 6:17/6:19—It’s hard to tell if she’s acting or actually unhappy from this face, but I’d argue that the speed at which she exits the room says more than enough. 6:49—She gives him one last chance, too. 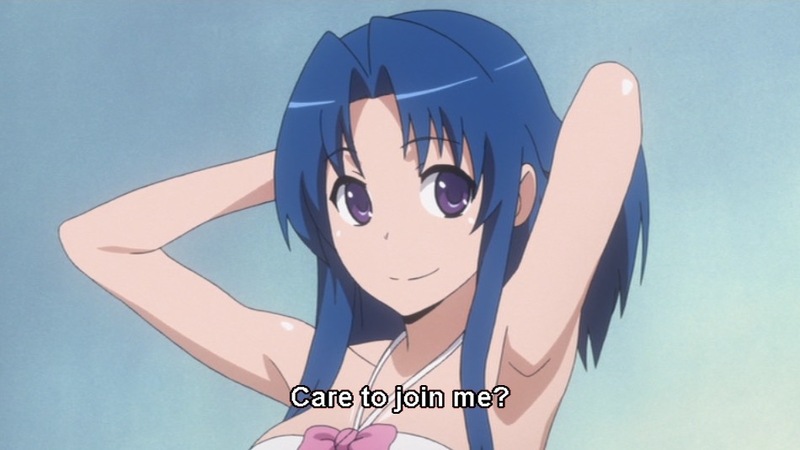 Is this Ami’s way of asking for trust? 7:39—Just a side note, but I really like the changes in the drawings when they’re in the shade. The slightly dimmed color palate and the solidity of the color look really nice and the character designs actually seem like they’ve been simplified a bit to me. 7:45—I really appreciate that we get these quick shots checking in on Ami when none of the other characters are watching her. Is she unhappy to be left out? Disapproving? 7:50—Again, her actions reveal what her facial expressions do not. It’s pretty dangerous to trust what’s on Ami’s face because she’s such a seasoned actor, but she can’t disguise her actions. 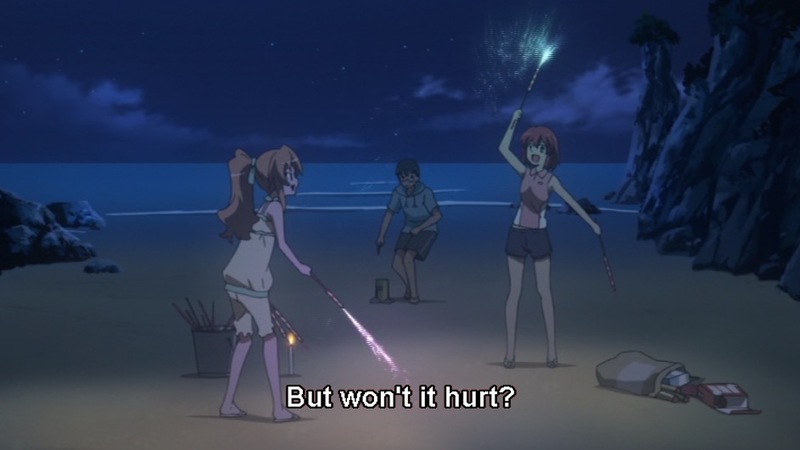 So, when she takes the lead and “helps” with the plan, we see that she wants in on the fun, even if she was hurt by Ryuuji’s earlier refusal to trust her. 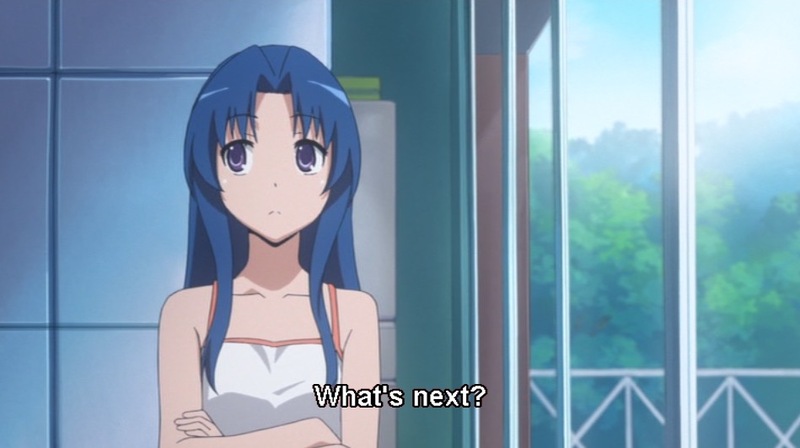 There’s a certain irony in the fact that Ami seems to demand straightforwardness from those around her, even as she is often the most duplicitous of all of them. 11:29—More props to the translators here. 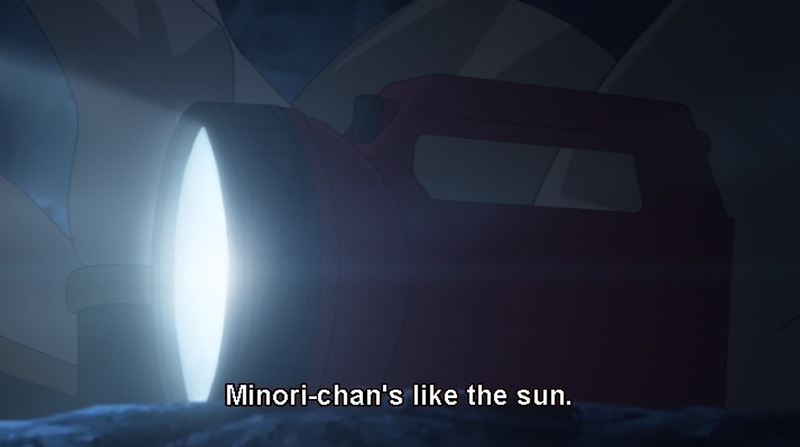 This is kind of a throwaway line, but the way it’s broken up into really short phrases caught my attention as really being fitting for Minori’s voice (and I mean her written voice, not her spoken one). 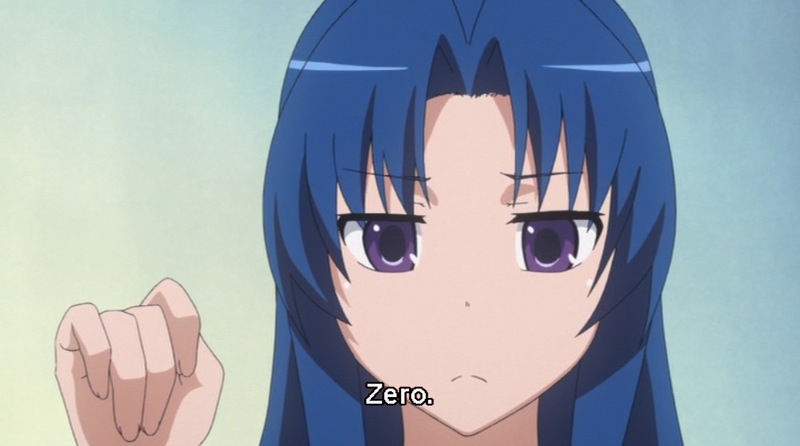 13:00—It’s like Ami can’t stop herself from quitting her act and flipping into brutally honest mode. The transition is really jarring, but it speaks well of her that she sometimes does exhibit the honesty she asks of others. 13:53—And then the whiplash is back, as if staying real is a struggle for her. 14:40/14:44—And again, the turn. The moon reflects the sun’s light. It’s dependent on the sun. 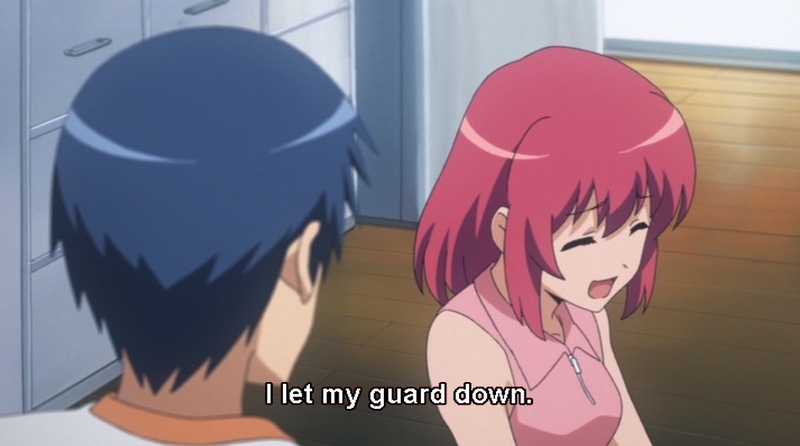 Ami warns Ryuuji that he might get burned, but I think her next line better demonstrates what she’s actually trying to say. 15:01—As always, her motives are hard to parse, but the reality of what she’s saying can’t be denied. 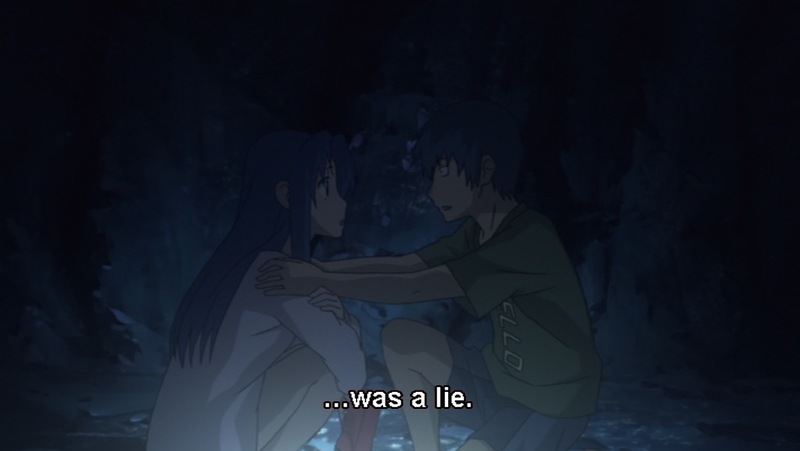 15:18—It’s actually pretty sad how Ryuuji almost abandons Ami in his panic over Minori. 15:27—She pushes aside her own hurt here, though, and gives him permission to chase after Minori: “Let’s hurry.” There are so many layers in her reaction to him catching her. I see thankfulness, relief, a bit of sadness, and a bit of love. 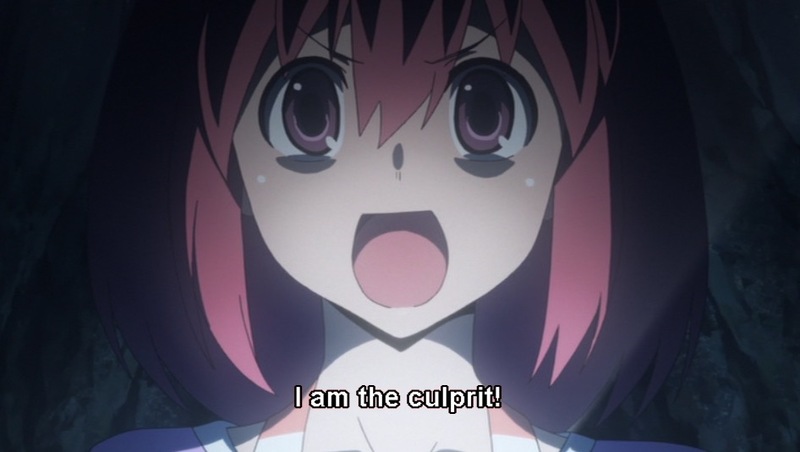 It’s like a reminder to her than she can’t stop Ryuuji from being himself or from chasing after Minori. 16:28—Great horror/thriller execution from a freaking rom-com. Layering the shouts of the characters adds a lot to the sense of claustrophobia. 17:20—You just know she had such a ball with this. 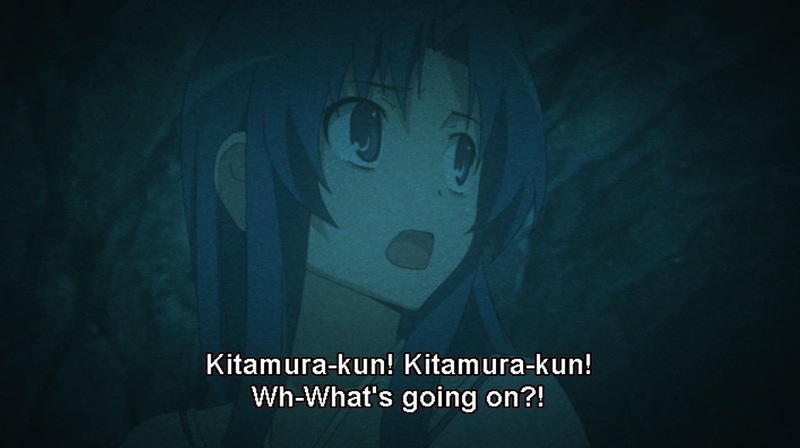 17:40—Pretty entertaining to see the difference in reactions between Ami and Ryuuji/Taiga. 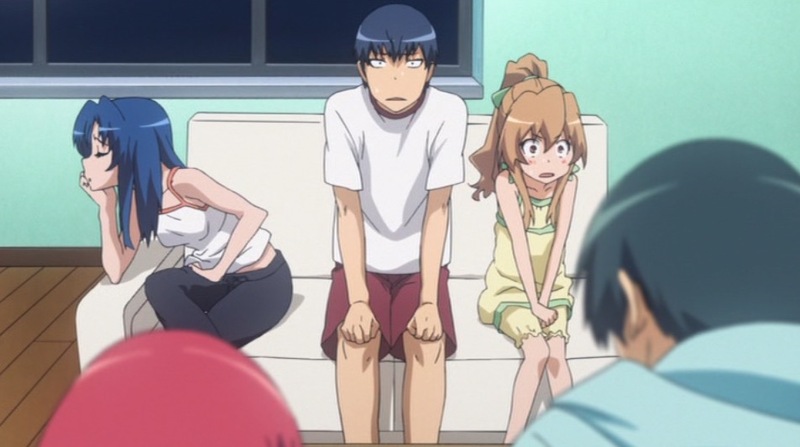 Ryuuji and Taiga are much more straightforward people, so they openly show how stunned they are. 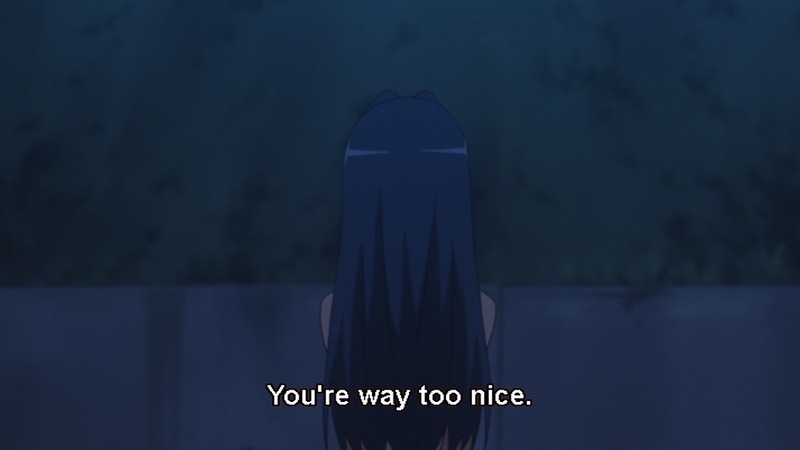 People who are used to faking out others aren’t usually happy to have been tricked themselves; thus, Ami’s annoyance. 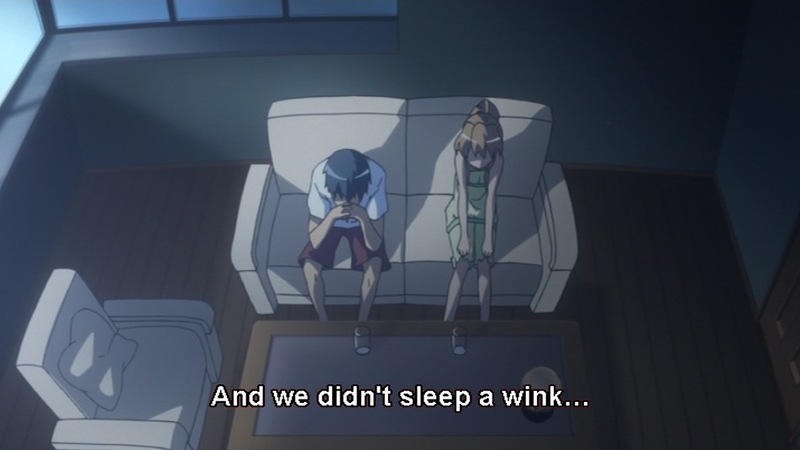 18:35—Omigosh, characters in an anime who actually remember previous conversations with each other! 18:59—Yes, of course it will. Thinking about stuff like this, about how you need other people, is always painful. It’s an admission that you can’t be fully self-sustaining. 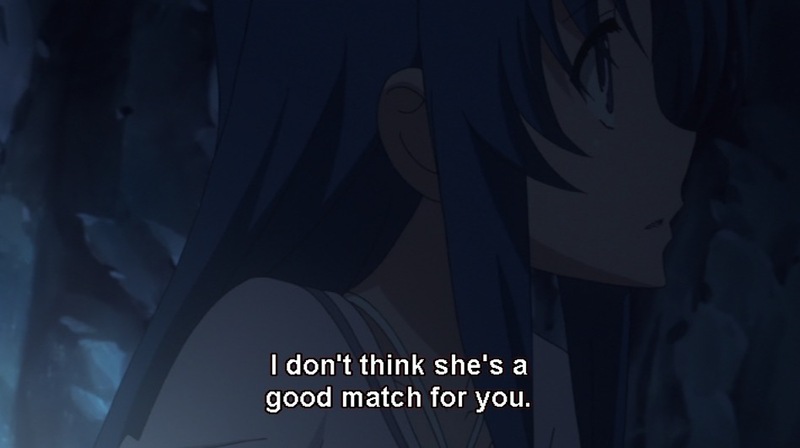 19:15—This goes back to what Ami told Ryuuji earlier about all the girls hating him and back to what I’ve been categorizing as Ryuuji’s personalized kindness. He’s the type of person who relates to others in a really specific, close ways. 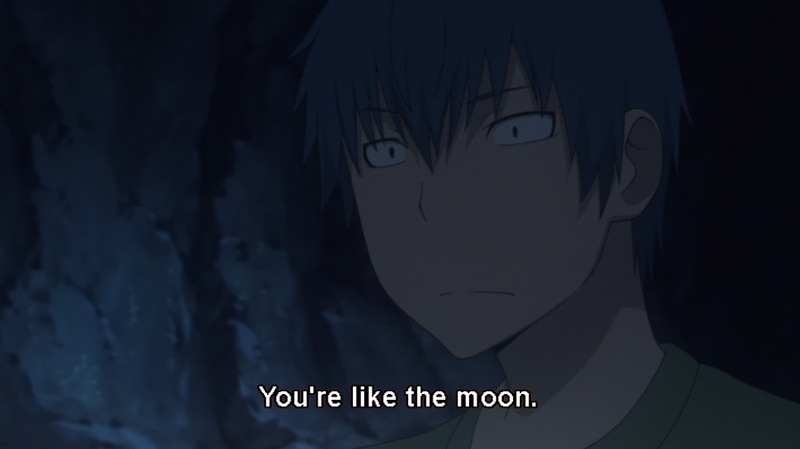 He’s like the “nice girls” from Oregairu‘s Hachiman’s speech. He leads people on without meaning to because he understands them so well and instinctively tries to be exactly the type of friend they need. It’s kind, but it’s also cruel. 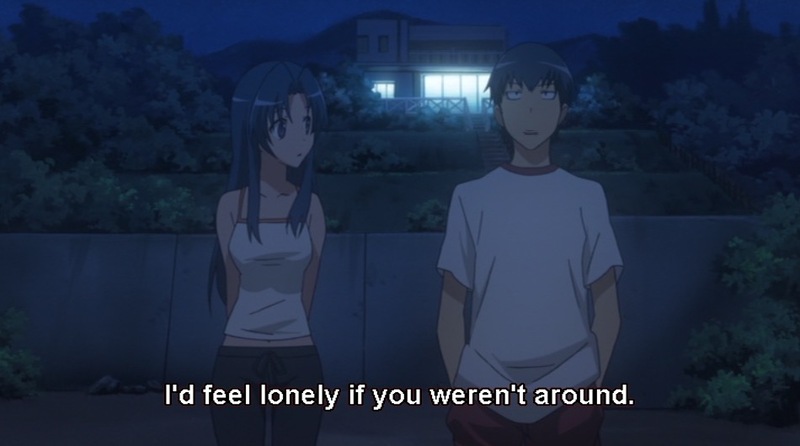 Especially when Ami already knows better. 20:03—Gah, this is so freaking important. 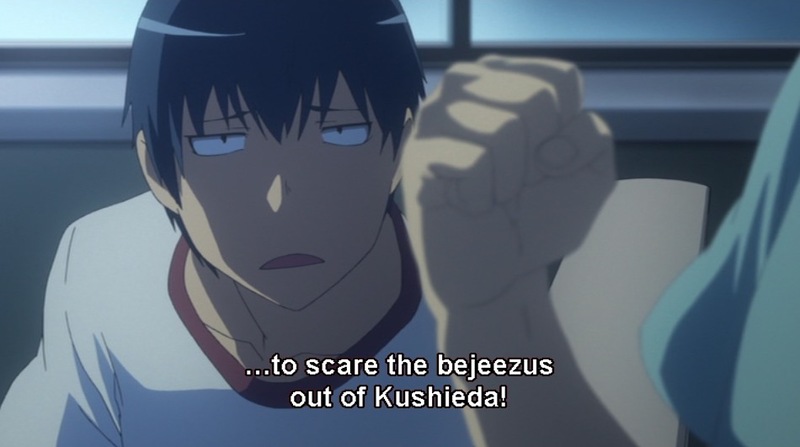 This is what Ryuuji does. He does his best to understand. 20:38—Minori’s telling him she’s been watching him. And could there be a more damning critique of his manipulative plot to get her to like him? 21:07—Easy for someone looking at the sun to say. 21:30—For the sun, it’s much harder. 21:53—And here’s another beautiful bit of visual direction. 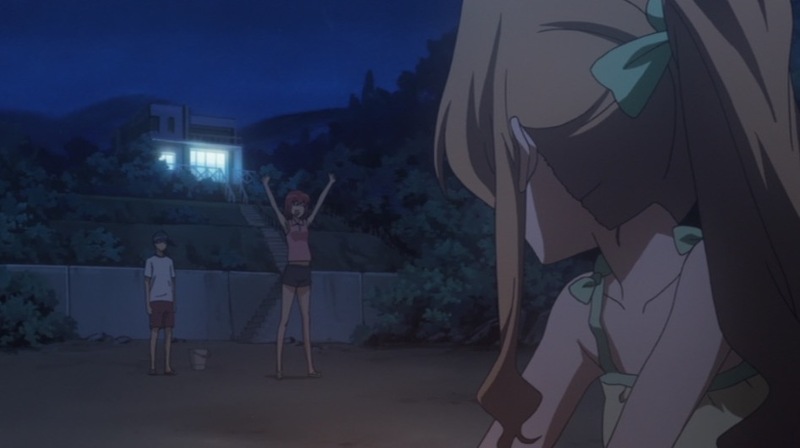 Minori’s jumping like crazy at the UFO she knows isn’t a UFO; Taiga’s not looking at all. She’s looking at something more real. 21:59—Kitamura faces it straight on. 22:02—And Ami turns away from it. 22:34—But, for all that’s happened on this vacation, we end up back in their ordinary world. That, in itself, says something pretty darn important. So that’s that! We’re into the double digits now and it’s pretty interesting to see which things have changed and which are exactly the same. 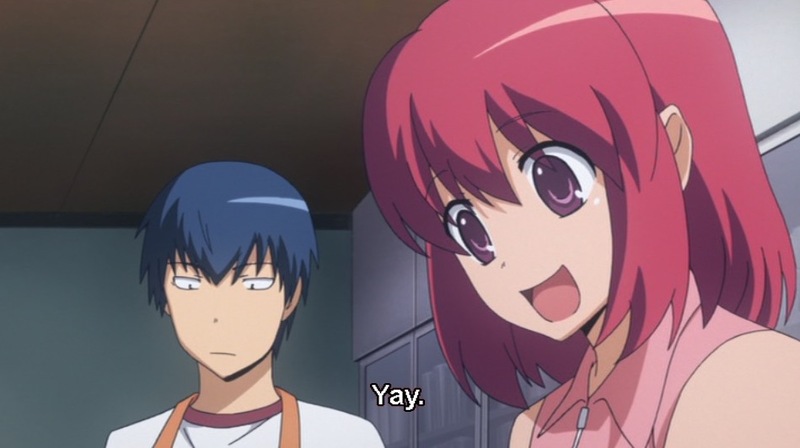 Ryuuji and Minori have certainly grown something like closer, while his relationship with Taiga stays the same. How have Ami and Kitamura been changed? That’s something we’ll have to wait to see, if indeed they have been at all. 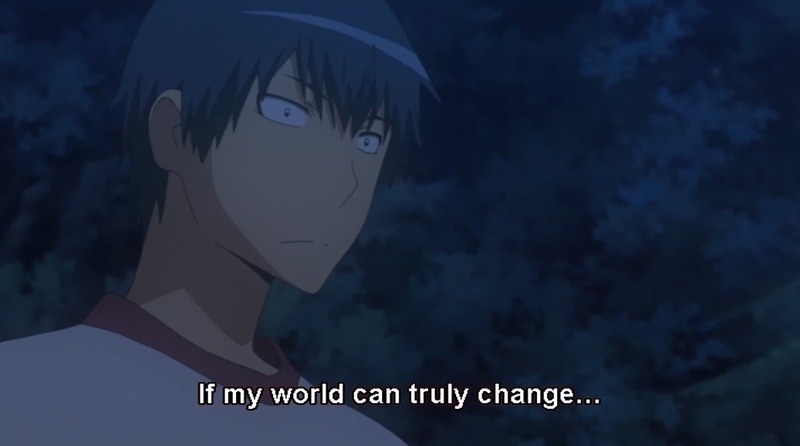 I really like the connection you made between Ryuuji and Hachiman’s “Nice Girls” speech. Very insightful, and a good lens to look at Ryuuji, since Hachiman explicitly provides the other side of the relationship. I’m often surprised at the connections that pop up in my head as I’m actually writing out these posts. That wasn’t in my initial notes for that shot at all! After this we’ll be rejoining you ‘live’ as you’ve now caught up to where we paused. Sorry, I’m going to have to praise you here. 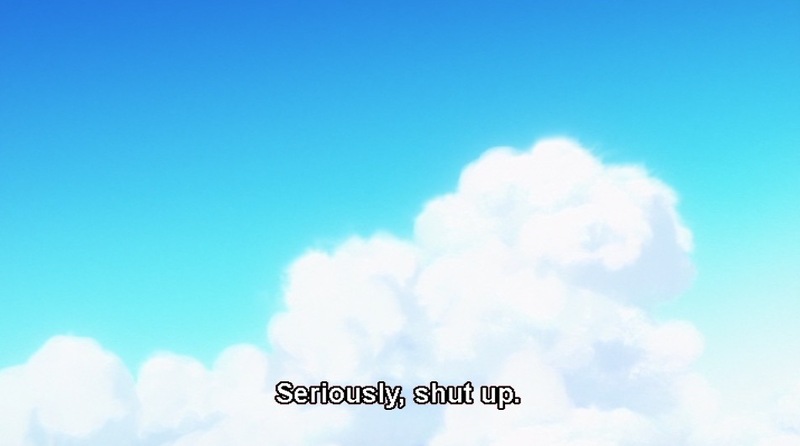 I recently read a comment on another venue arguing that the visuals in anime aren’t really all that important. But with this recap and others you make such powerful arguments for the power of the visuals, be they metaphorical, dramatic, narrative, or character centered. I’m really loving your screen cap choices and commentary. I want to send more folks this way, and I will, but I don’t want to be casting pearls before swine. & thank you very, very much for your kind words. This has been, to say the least, a much bigger undertaking than I had originally expected, so all your positive feedback has really helped to keep me motivated! I don’t know how the hell someone could ever say that visuals in anime aren’t important. It’s absurd, really. The fact that it is hand drawn means that everything single frame of every single scene is deliberately chosen. Sure, there are some lazy shots. 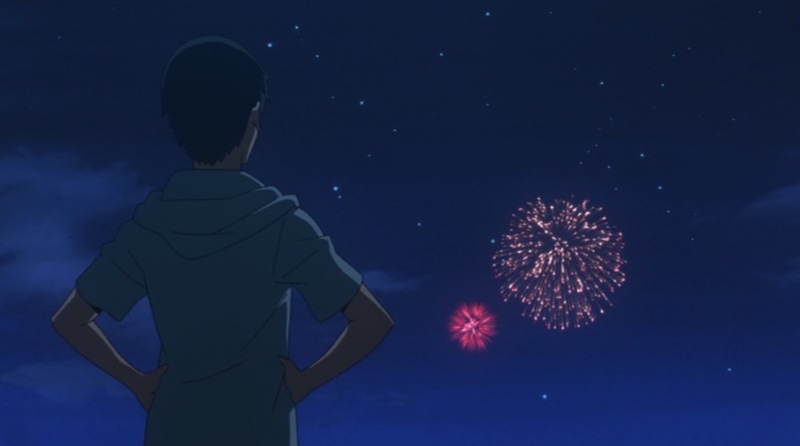 But the amount of freedom that anime provides and the attention to detail that it demands means that to dismiss the visuals is to dismiss the medium itself. 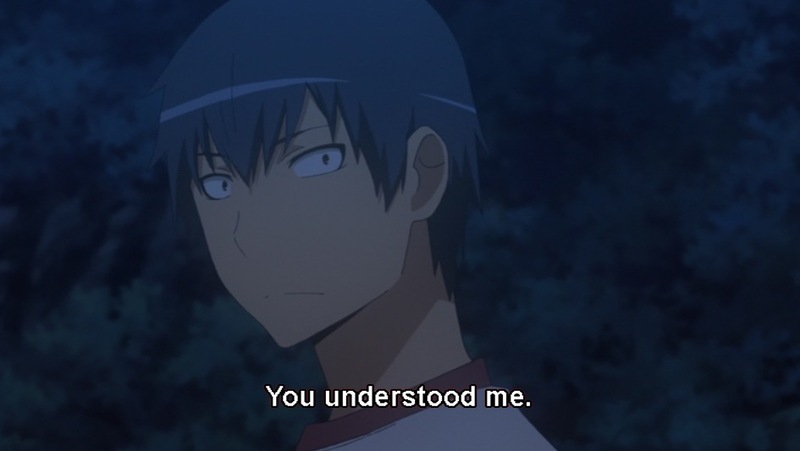 The thing, however about Hachiman’s ‘nice girls’ speech is that (at least as far as I can see) , Hachiman was nursing a kind of self serving delusion. There may have been some truth in what he said, but how much? If we take it with the rest of what he said it adds up to a kind of misanthropic chuunibyou. And Ami may also have a point, but is cruelty without malice cruelty, or just clumsiness? No, you’re right. Hachiman’s “nice girls” are just nice girls. The problem there is with him. But that’s still a perception he has and not, I think, an entirely bogus way to see the world. While taking offense at the kindness that is offered is certainly on him, there is still a sort of responsibility that stays with the nice girls to consider their actions. 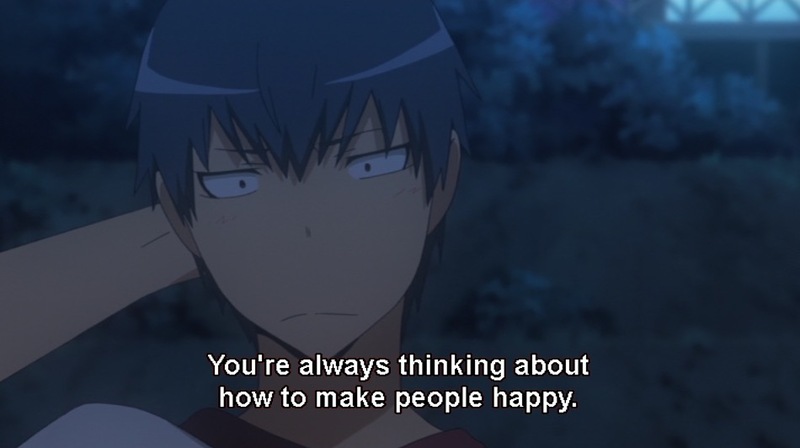 Now, Hachiman basically considers all kind actions as belonging to “nice girls” of the bad variety. 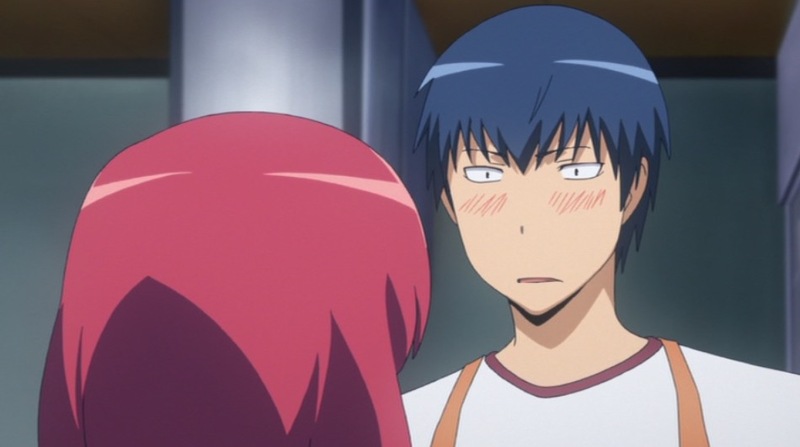 Ryuuji is a bit of a different case because he struggles to draw appropriate boundaries in relationships. There are times you can be too kind, too willing to open up a relationship that you maybe ought not to open. 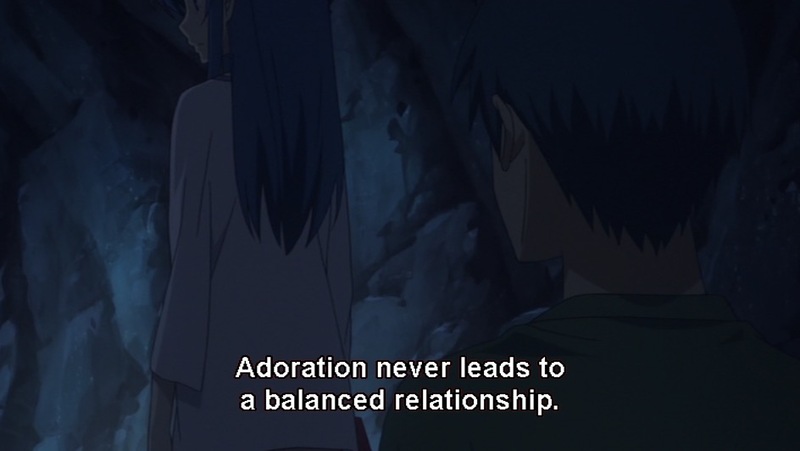 In the specific case of Ami, he kind of treats her with a kindness disproportionate to the intimacy of his relationship, and she’s warning him that he can’t have that sort of relationship with every girl. You can have one exclusive relationship. For her, he already has that—and it’s with Taiga. 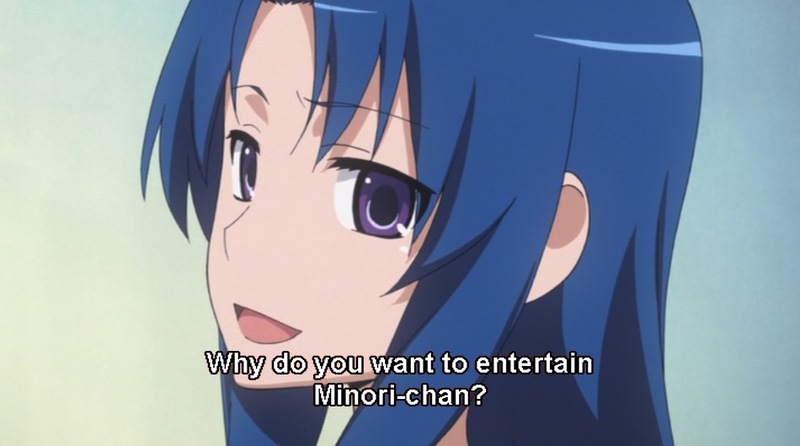 Not with her or Minori. So for him, as she sees it, deepening a relationship with her in this particular way is a cheat. He can’t have it because of the relationship he already has, although he doesn’t recognize that relationship for what is. 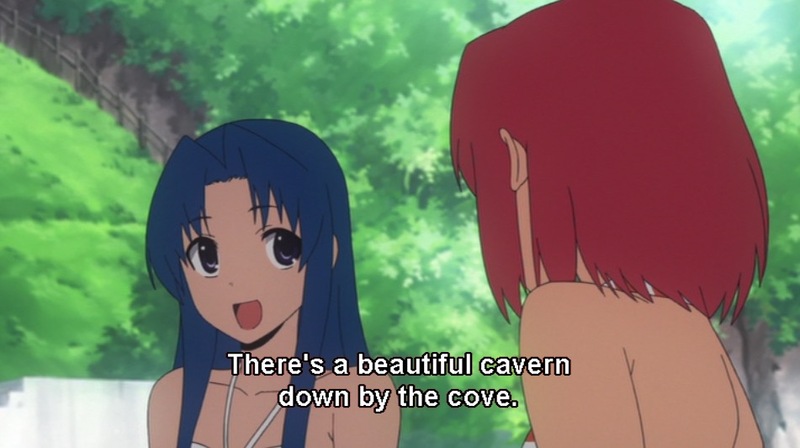 But Ami does, so it is clumsiness on Ryuuji’s part—but it will still feel cruel to Ami because it’s like he’s taunting her with something she knows they can’t have. 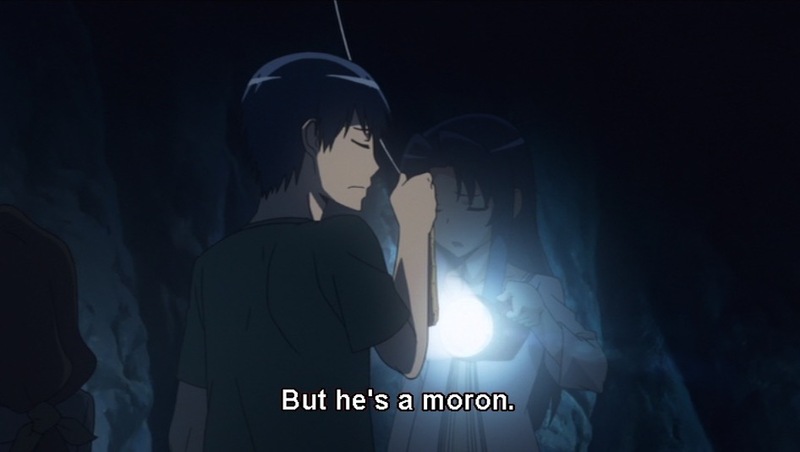 4:18 – I think that Minori is being honest and giving him a sincere compliment, in her own Minori-ish way. But I also think there’s a bit more to it. 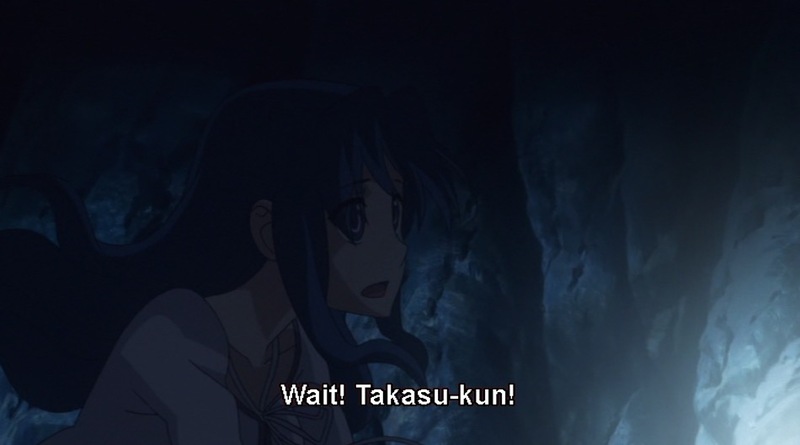 His actions up until now have all been focused on Taiga. 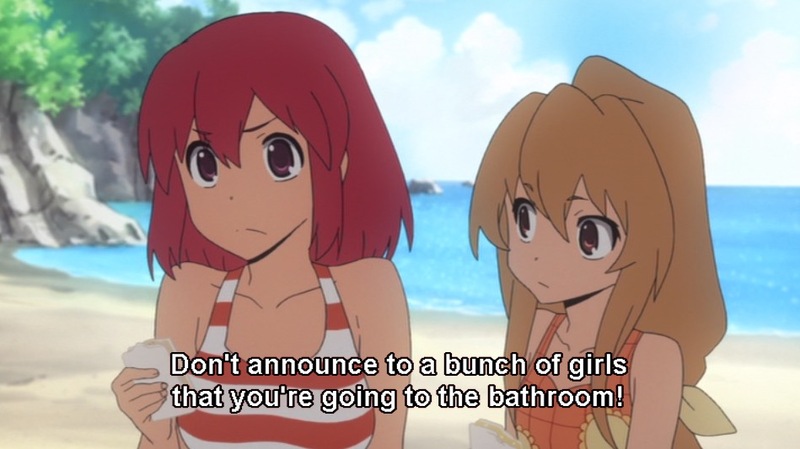 They keep insisting they aren’t dating, but the blunt truth is that guys don’t normally treat their platonic friends the way Ryuuji treats Taiga, which is exactly what Ami keeps warning him about. 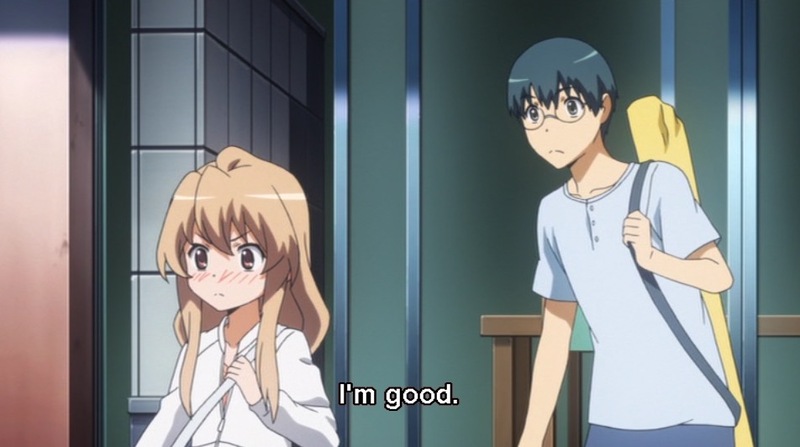 And of course, Taiga also made her own feelings clear in ep. 8. 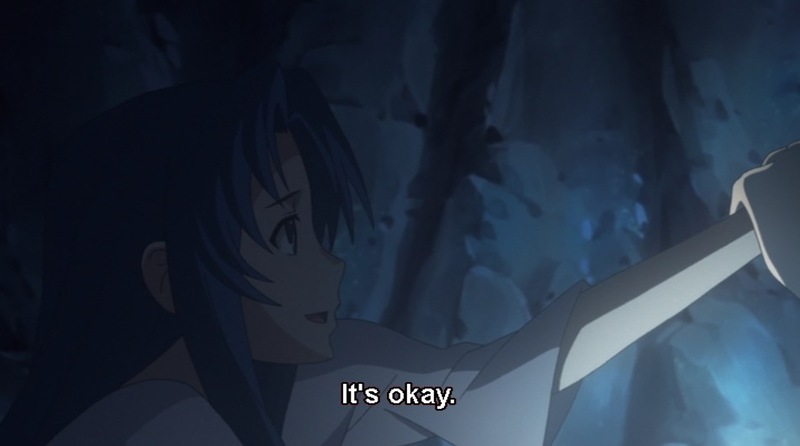 Given all that, it was easy enough for Minori to mask her own feelings, wait for them to make it official someday, and just be happy for them. 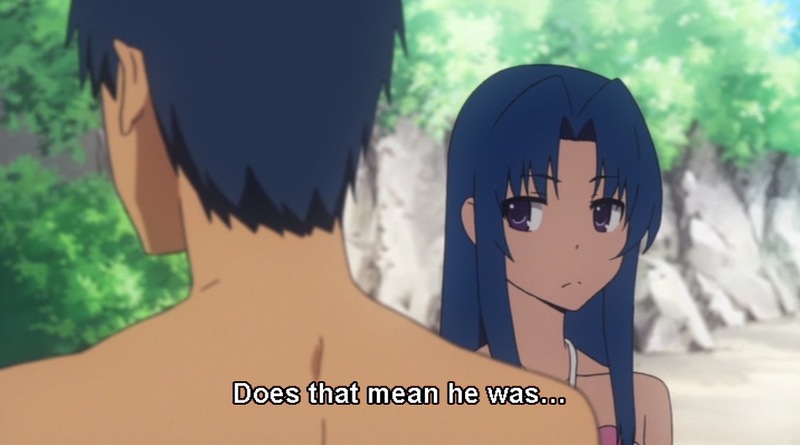 But now Ryuuji suddenly comes out last night and drops some pretty clear hints – out of nowhere, from her perspective – that he actually likes her instead (let’s face it, a guy doesn’t normally ask a girl if she has a boyfriend unless he’s hoping she’ll say no). Now she doesn’t know what to think or whether she dares to get her hopes up. So I think that while she does mean what she’s saying, she’s also fishing a bit too, wanting to see how he responds in case it might help her start deciphering those mixed signals. That sounds like the best answer, at at least a very good one. It is kind of a confusing scene, especially given how inscrutable Minori has been until they have the conversation on the deck.